The Bubí Bainne nursing cover makes breastfeeding in front of other people easy and discreet. So whether you are in a crowded restaurant, sitting next to your father-in-law, in a shop, or at a wedding, you just discreetly latch your baby on under the cover and breastfeed to your heart’s content! Our guarantee is that no-one will notice. Each nursing cover is made from the highest quality 100% cotton. They come in a variety of colours and fabrics. Bubí Bainne Nursing Covers allow you to nurse discreetly in public. There is no need to ‘flash the flesh’! 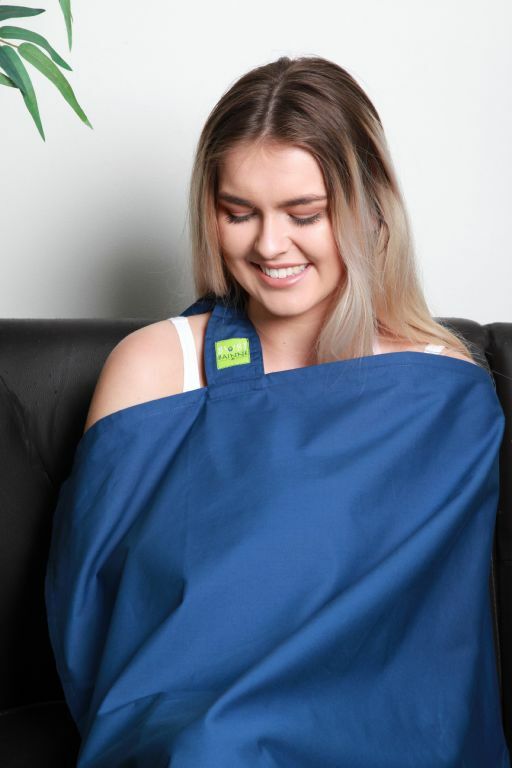 Breastfeeding in public is easy with this Irish-designed nursing cover! Connect the neck straps by threading the long strap through both D-rings and then back through just one. Place the Bubí Bainne over your head. The straps should fit comfortable around your neck and the fabric should drape over your baby. Positition the rigid centre part of the neckline so that you can easily view your baby while nursing. Arrange your baby in a nursing position under the cover and breastfeed as normal. Bubí Bainne nursing covers are machine washable at 40 degrees. Tumble dry low. Iron on low temperature. €24.95 including FREE shipping Worldwide! "I found the covers very easy to use they were very discreet & take up no room in your bag. At such a reasonable price I bought one for my changing bag & one for at home & the super quick delivery meant I was able to nurse anywhere anytime in comfort. I honestly can't credit them enough........thank you for a great product x."